Shoji in Japanese architecture refers to the sliding doors and windows made of a latticed wooden frame covered in translucent white paper. 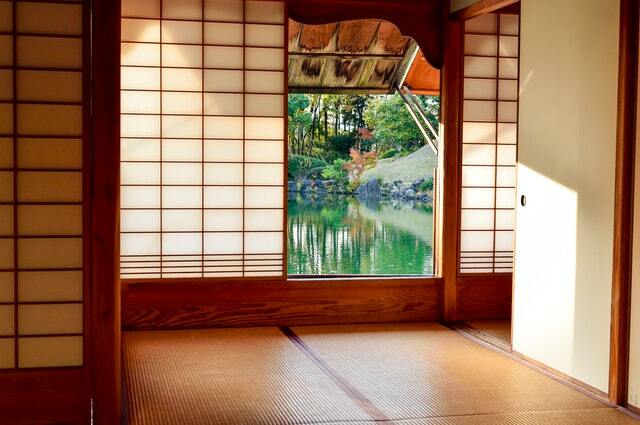 In summer, Shoji doors are often completely removed to open up the house to help alleviate the humidity of the season. The Washi paper used to cover the doors make the Shoji perfect for allowing light into a room due to the reflective nature of paper. This made private rooms much more accessible and easier to light before glass doors were available. The doors are a characteristic of the Shoin style and are a recognisable aspect of traditional Japanese architecture. The Shoin style first appeared in Japan during the Kamakura Period (1192-1333). The name comes from the Shoin, a study alcove that opens out onto a veranda. Shoji doors and windows are important aspects in the Shoin room and therefore, the style. Shoji doors are essential for the Chashitsu, a Japanese tea room, as a very specific tea ceremony takes place here. Learning how to conduct the ceremony includes being taught the right way to delicately open the Shoji doors. What do you think about Shoji doors? Would you consider having them in your house? This entry was posted in Company News and tagged Ceremony, Japanese Doors, Japanese architecture, Shoji, Sliding, history, sliding doors. Bookmark the permalink.